I love mac ‘n’ cheese. It’s a vegetarian staple, and one of my favourite comfort foods…. but it has to be done right! The internet is full of recipes for stove-top mac ‘n’ cheese, low-fat mac ‘n’ cheese, low-carb mac ‘n’ cheese… macaroni cheese with cauliflower, spinach, broccoli.. and whilst I’m sure they’re all pretty great, nothing beats a big dish full of creamy, pasta, with a crunchy cheesy topping. Especially on a cold winter day! So here is my recipe for what I genuinely consider to be the ‘best ever’ mac ‘n’ cheese. 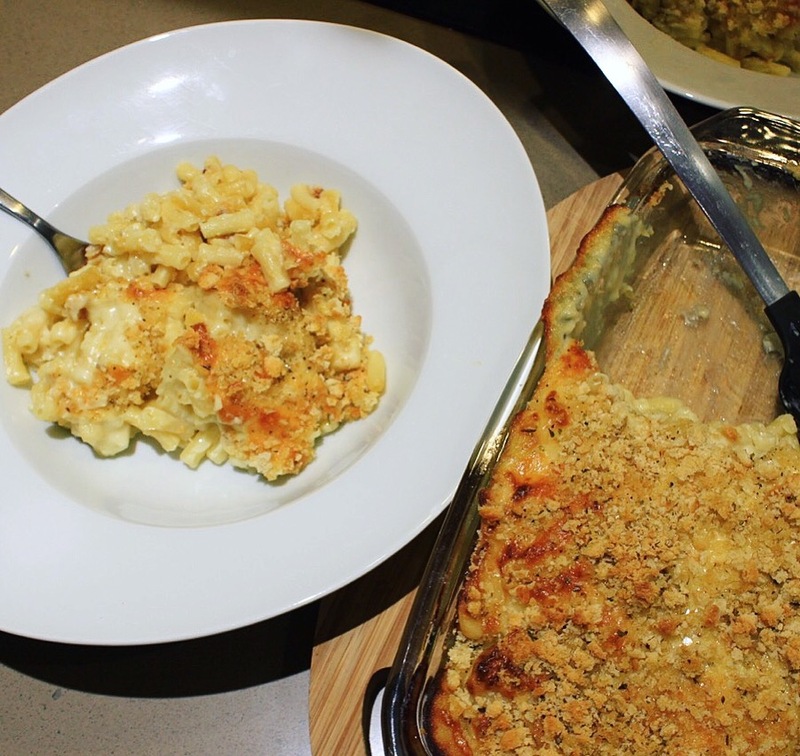 It’s super simple, it’s super cheap and it’s thousands of times better than the stuff you get in the supermarket… trust me, I’ve eaten a lot of macaroni cheese in my time! First, cook the dried pasta for 2/3 of the full cooking time suggested on the packet. Drain and transfer to an oven proof dish. Take the saucepan off the heat, add a little of the milk at a time. Whisking constantly. Pour the cheese sauce over the pasta, and top with half the remaining cheese and a little bit of salt and pepper.. for good measure. Using a food processor (or grater) blitz the bread into breadcrumbs, add about half a teaspoon of oregano and black pepper to the crumbs before sprinkling evenly over the top of the pasta and sauce. Top with the remaining cheese and transfer to the oven for 20-25 minutes. I tend to turn the grill on for a few minutes at the end to really brown up the bread crumbs. It’s so good, I ate a tonne of it last night! I have never tried macaroni with mustard. Will give it a try. Thanks for the recipe!